The release Jason Marsalis Vibes Quartet - In a World of Mallets layers in the unique sounds of the vibraphone, tubular bells, xylophone, and glockenspiel as the "lead" for a progressive blues and jazz sound. Do not let the instruments fool you; the sound is true and solid. 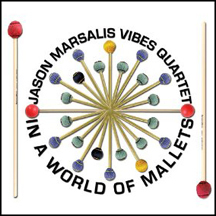 Jason Marsalis Vibes Quartet - In a world of Mallets was produced by Jason Marsalis and was released on the Basin Street Records label. Recorded in Jason Marsalis' home town of New Orleans, this is the third release on the Basin Street Record label, and the first release with Jason's new band, the Jason Marsalis Vibes Quartet. The release has Jason in his familiar role as the bandleader, as well as vibraphonist. The youngest member of the illustrious musical Marsalis family, Jason is well known for his drumming, but on In a World of Mallets he trades in his drum sticks for vibraphone sticks and the beat goes on. This unique release opens with the track Discipline Discovers a World of Mallets a brief introduction into the world of vibraphones and tubular bells. The brief tease of the vibraphone sound transitions to the track Blues Can Be Abstract Too, and as the title states, the blues can be abstract in the hands of the talented Jason Marsalis as he stamps out a groove that rings like a pianist showing his chops on the keyboard, but instead of 10 fingers and foot pedals, this is two mallets. Not to be out done, Austin Johnson chimes in with his own "mallets," 10 fingers on the piano, and the track turns funky. Ballet Class is a whimsical journey across genres with a tug at classical music with a jazz beat. A little fun, but a lot of pace and depth produces a stirring track. The track Characters slows down the pace and displays the breath of the vibraphone and its complement to the traditional 3 piece jazz ensemble of drums, piano, and bass. Blue for the 29%ers is a look at a fast paced jazz beat accented by the baseline of Will Goble on bass and Dave Potter on Drums. The track My Joy starts off with a playful series of chords lead by the vibraphone and tubular bells that carries the pace throughout. Ill Bill is a clean jazz beat paced by the keyboard work of Austin Johnson and complemented by the mallet work of Jason. Louisiana Gold is a jiving beat that will catch you snapping your fingers and tapping your toes. The track is a series of duets between the piano and the vibraphone with a dance around by the snare drum work of Dave Potter. The track Big Earl's Last Ride is a tender and moving song with the bass notes tugging at the heart strings, and the soft keyboard work carrying the beat. The release also includes the tacks, The Nice Mailman's Happy Song to Ann, Nenhum Talvez, Closing Credits, Whistle for Willie, and Discipline Gets Lost in a World of Mallets. If not by any other means, the songs' titles alone give a glimpse into a creative, whimsical, and truly entertaining release that is centered on the vibraphone, but rings true to the energy of four talented musicians. Websites where you can procure Jason Marsalis Vibes Quartet - In a world of Mallets are Amazon, CDON.Com, Basin Street Records, and Newbury Comics. © February 2013. Luxury Experience. www.LuxuryExperience.com. All rights reserved.